The larynx consists of a cartilaginous framework with a mucosal lining on the inside. There are several muscles on the inside and one paired muscle on the outside of the larynx which work together in order to position the individual components of the larynx during speech, breathing and swallowing. The vocal folds are a laminated structure consisting of mucosa and muscle. The overlying layer is called epithelium, which covers the underlying lamina propria. The lamina propria contains a superficial layer, called superficial lamina propria (SLP) or Reinke’s space, and a deeper layer, which includes the vocal ligament and the vocalis muscle. The SLP is an amorphous, gel-like substance, which makes the vocal folds pliable and allows them to vibrate during phonation. 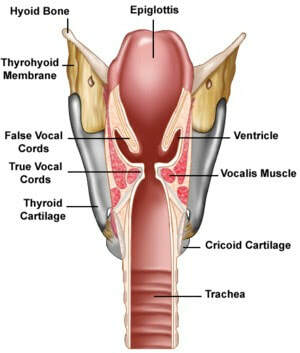 During phonation, the vocal folds are brought together. The laryngeal muscles control the exact position of the vocal folds and they control how airtight the glottic valve is. These muscles can also control the stretch of the vocal folds, which in turn determines their pliability. Due to the pliable layer of the vocal fold, a mucosal wave travels over the vocal folds while the glottis aperture opens and closes. ​ Voice production requires multiple systems to work hand in hand. The lungs need to generate sufficient aerodynamic pressure to push air through the larynx. The vocal folds need to be functional in order to convert the aerodynamic energy into sound. The areas above the vocal folds (throat) serve as a resonator and convert the sound, generated by the vocal folds, into a human voice. Voice production is a very complex system and it can easily be malfunction by the smallest structural change along the vocal folds or by poor use of the laryngeal muscles resulting in hoarseness or early vocal fatigue.